Hello, learners! Greetings from Makerdemy. 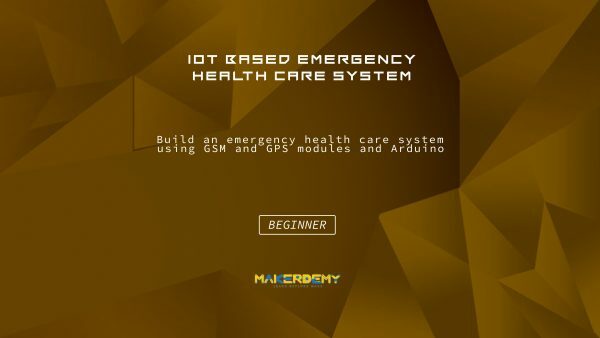 In this course, you will learn how to program the emergency health tracking system using GSM and GPS module with Arduino board using heart pulse sensor. This is an advanced level course on Arduino. This course is designed for advanced makers. We’ll help you to get started with the basics of creating circuits with the Arduino UNO board. We will show how to measure the heart rate using Arduino and display the data on I2C type 16×2 LCD and send the GPS location to the User via SMS. By the end of this course, you would have built Emergency Tracking Systems using GSM and GPS modules. Project 1: In this project, we will teach you how to measure your heart rate using a dedicated Arduino-compatible sensor. Project 2: In this project, we teach you how to make the connection of I2C type 16×2 LCD and display the message on the screen when the user types on the serial monitor. Project 3: This project will explain to you how to make a call using SIM900A GSM module which it connects the Mic and Speaker on GSM. Here, in this project will explain the program using Serial and SoftwareSerial communication methods. Project 4: In this project, you will get the accurate location of the user using Arduino GPS_Get Latitude and Longitude Coordinates with SoftwareSerial communication program. Project 5: In this project, we will teach you how to measure your heart rate using a dedicated Arduino-compatible sensor. Then, we will transmit the data via SIM900A module to send a message and call to the respective person to get the details. Even we will send the GPS location using GPS module, and also display the heartbeat on the 16×2 LCD screen. This project can be used to develop Wearable for wrist pulse band. This project helps in real time to track the people who are not well and cure them of heart stroke. At the end of the course, you’ll be fully familiarized with Arduino and ready to build your electronic security system. I look forward to you joining this course. It provides the complete source code of the real time project. Let’s dive in to learn the concept one by one.